Making the cookies: Preheat the oven to 350 degrees. Line 2 baking sheets with parchment paper. Combine the flour, baking powder and baking soda in a large bowl. In a separate bowl, beat the butter and both sugars with a mixer on medium-high speed until fluffy. Beat in the eggs one at a time on medium speed, then beat in the vanilla. Add the four mixture and beat on low speed until combined. 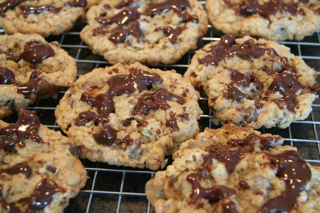 Stir the oats, cereal, chocolate chips, pecans and marshmallows into the dough with a wooden spoon. Drop heaping tablespoonfuls of the dough onto the prepared baking sheets, about 3 inches apart. Bake the cookies in batches until golden, 10 to 12 minutes. Transfer to racks to cool. Making the topping: Combine the chocolate chips, marshmallows, half-and-half and cayenne pepper in a saucepan over medium heat; cook, stirring, until the mixture is smooth, about 5 minutes. Remove from the heat. Stir in the pecans. Drizzle the mixture over the cookies and let set, about 4 hours.